I first became intrigued by the concept of jade rolling when my co-worker asked me if I owned one (she was practically obsessed with hers). When I told her no, she went on to say she was surprised. "It seemed like something you would definitely use," she told me. Given that said co-worker knows my very specific coffee order by heart and my favorite places to grab lunch, I trusted her instinct and went to work digging up all the information (along with tips on cleaning up my skincare routine, another interest of mine as of late) I could find about the photogenic tool I've seen floating around Instagram. While jade rolling may seem like a new trend in the beauty world, herbalist, acupuncturist and founder of self-care line Vie Healing Mona Dan actually tells us the practice has been around for thousands of years: "It's a cooling crystal that helps protect the skin, minimize pores and assist with trapping blood flow right under the dermis layer of the skin, assisting in lymphatic drainage, increasing blood circulation and reducing puffiness." My co-worker actually swears by her jade roller for helping prime her face before applying beauty products, and Mona agrees: "It's also a great tool to use for product penetration, as it activates blood flow but then seals in the product being used." 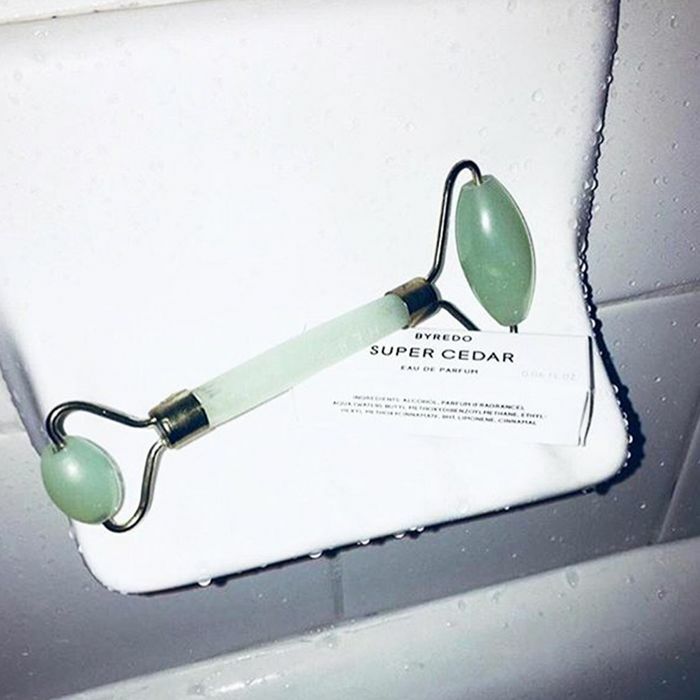 For just one tool, the jade roller seems to address a plethora of skincare concerns, ranging from reducing puffiness to smoothing out fine lines and wrinkles. A brighter complexion, smaller pores, and reduced inflammation also often make the list. But what most can definitely agree on is that jade rolling is a therapeutic practice that injects a few moments of self-care and active meditation into your daily routine. While many of the facial rollers utilize crystal jade, some come in rose quartz or even amethyst. But perhaps the reason the jade roller is so popular is because of jade's notoriously cooling properties. "Jade is a cooling stone and has been said to be great for reducing aches and pain, and great for usage for sensitive areas of the body. Also, if you've noticed, jade bracelets have been used for keeping the body balanced and to keep away aches and pain of rheumatism," Mona adds. Unlike time-consuming, overly complicated skincare rituals, jade rolling is quick and easy. Apply a serum or oil to your skin and roll the tool gently upwards, starting at the chin and rolling up the cheekbones and forehead. 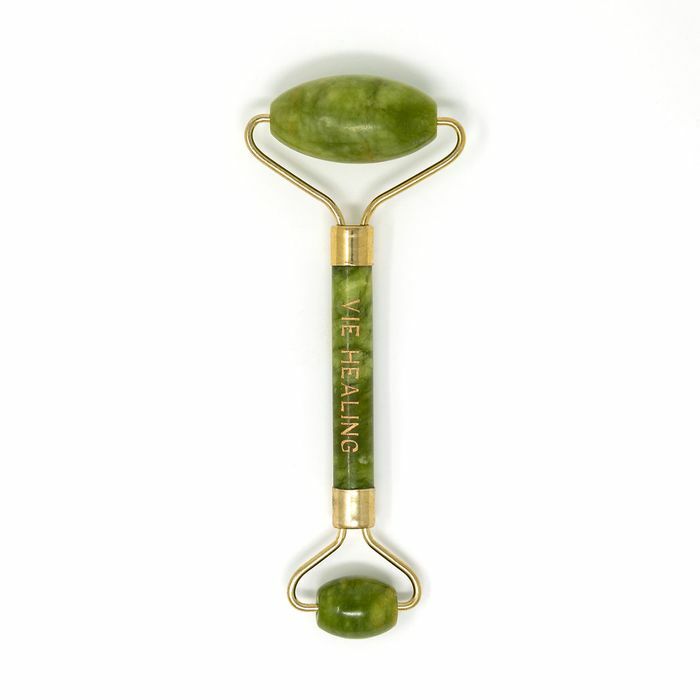 You can use the smaller jade to roll horizontally across your eyelids and eyebrows, as well. Dermatologist and founder of wellness brand Shiffa Dr. Lamees Hamdan suggests using yours daily. "If you have under eye puffiness or retain a lot of water (possibly due to salty food, etc. ), adding it in the morning will give you better benefits than at night". Many brands also recommend keeping your jade roller in the fridge to enhance its cooling effects (also makes for a better wake-up call, right?). Do you own a jade roller? Add to the discussion in our Facebook group. Next up: Here's what happened to one editor's skin when she went dairy-free.